Warped Clipper Ship is a new work in ceramics that continues my interest with appropriating iconic paintings and images from American History, in this case and altering the work in a way that relates to its content. The image itself references an early American painting of a clipper ship plowing ahead at full speed in an optimistic expression of technology, innovation, and nationalism. The crumpling of the work refers to the gesture of the artist that has made a failed image. The rendering of the image and crumpling in ceramic concretizes the moment of recognition of failure and alludes to the repressed histories of clipper ships and colonialism including Orientalism, opium dens, pirates and slave trade. 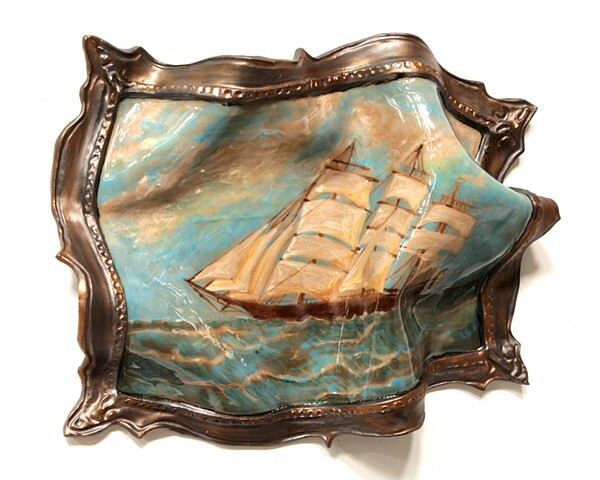 The wavy undulations of the ceramic form also make the image of the clipper ship appear to be underwater with its resultant distortions, as if the viewer is regarding a sunken history.